PTW playing cards are popular used in Italy for being incredibly flexible, slick and washable. We can mark the PTW playing cards so perfect that you will enjoy the invisible marks great with the infrared contact lenses. About the ways to mark PTW poker cards, we always mark blue cards with big font in the middle, and mark red cards with small font in four corners. Both of red cards and blue cards are marked with infrared invisible ink and printer by our technicians, of course we can get very good quality marks on the playing cards. 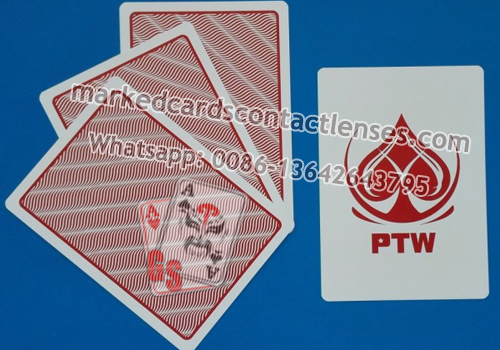 When you see the cards with naked eyes, the cards are just the same as origin cards, but when you see the cards by wearing our infrared contact lenses or sunglasses, you can see that there are luminous marks on the back of PTW playing cards. We can mark special signs according to your special requirements. Just contact for more!